well, it's been coming down the pike for a while now, although somehow i hoped we'd find a way around it. london's routemasters are retiring tomorrow...these are the old style hop-on busses which are as much a part of london as the houses of parliament and the thames. i get all misty eyed thinking about the creaky 23 taking me from liverpool street station to westbourne grove, with the conductor coming through and checking everyone's tickets. there will still be double-deckers, but they're the new style ones with the non-spiral-staircase in the middle. also, there will be notorious "bendy busses". we new yorkers are familiar with these as an entirely inefficent way to design a bus. the idea of putting as many people as possible far away from the doors, making it impossible to fill and empty the bus, confuses me endlessly. 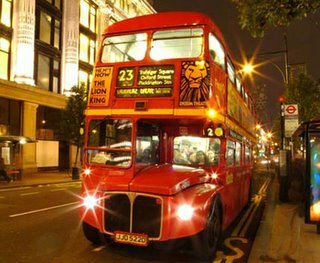 someone once asked me what kind of car i'd want to be and without missing a beat, i said "a red double-decker bus". when pressed as to the reasons behind my choice i said: "it's totally silly and extremely useful, and red".